Jellyfish contain 95 percent water, are semi-transparent and come in a broad range of colors, sizes and shapes. Their tentacles catch drifting food and carry it to their mouth that is inside of their bell shaped body. Jellyfish play an important role in the oceanic food chain and the ecosystem. Jellyfish are carnivorous and feed mostly on zooplankton, comb jellies and other jellyfish. Large species of jellyfish feed on large crustaceans and other marine organisms. Sea turtles, sunfish and spadefish prey upon jellyfish. The cannonball and mushroom jellyfish are a delicacy in Asia. Jellyfish occupy every major ocean in the world but primarily live throughout the Indo-Pacific and in coastal waters off Northern Australia. Jellyfish are adept at withstanding a broad range of salinities and temperatures. Many live in shallow coastal waters and drift with the currents, often gathering in estuaries and secluded bays. Jellyfish are sensitive to light and move down to deeper waters during the hours of bright sunlight. Jellyfish move closer to the surface in the early morning, late afternoon and evening. 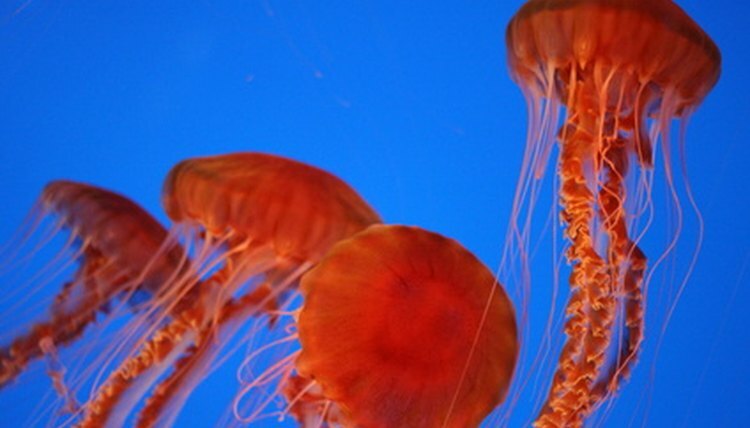 Because of their limited horizontal movement, jellyfish largely depend upon ocean currents, tides and wind for motion.